Stems simple or sparingly branched, erect, smooth, 1 to 31/2 feet high. Leaves opposite, thin, ovate to ovate-lanceolate, sharp pointed at the apex, blunt to slightly heart-shaped at the base, 2 to 6 inches long, one-half to 3 inches wide, the margins and short petioles hairy. 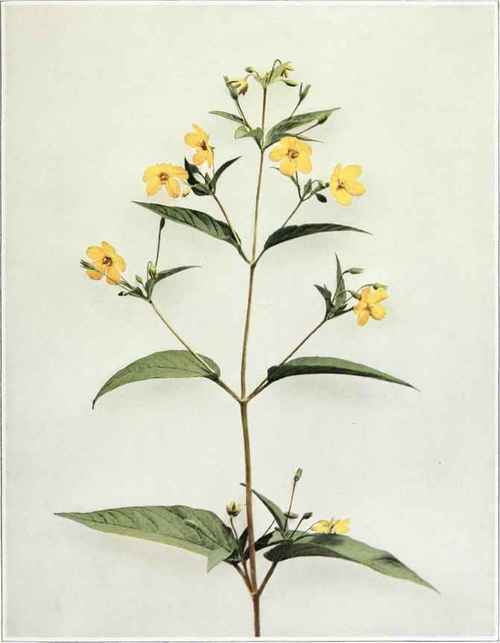 Flowers one-half to 1 inch broad, on slender stalks in the upper axils; lobes of the calyx lanceolate and sharp pointed, shorter than the five yellow segments of the corolla, which are finely toothed toward their tips; stamens five. Fruit a five-valved capsule, slightly longer than the calyx. In moist thickets and open woods, Nova Scotia to British Columbia, south to Georgia, Kansas and Arizona. Flowering from June to August.